Chariot free on Xbox One in October, but what is it exactly? During Microsoft’s E3 indie showreel a fair few games managed to raise our collective eyebrows. The Silly Symphonies inspired scrolling shooter Cuphead was one of these; co-op 2D platformer Chariot another. Frima Studio’s Chariot is arriving on both PlayStation 4 and Xbox One next week, swinging in at the sweet low price of nothing for Xbox One gold members. Chances are your interests are now suitably piqued too. 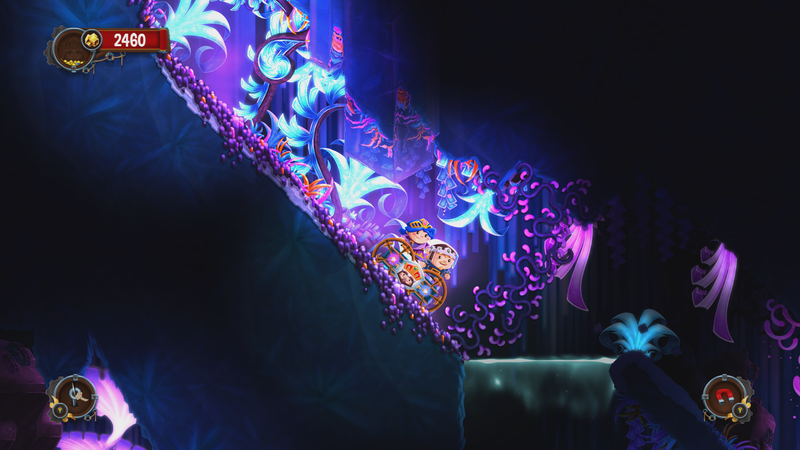 This puzzle platformer has a focus on physics, with the two lead characters – a princess and her fiancé – in control of a chariot carrying a recently departed king. The plot is pleasingly simple – to find a suitable burial plot deep inside royal catacombs. His Majesty himself comes along for the ride as a ghostly spirit, an unwanted backseat driver if you will. The new launch trailer shows the late royal ruler bickering over his final resting place. Expect a pace faster than most puzzlers due to the chariot moving at a fair old lick when rallying down slopes and launching off ramps. In a way it reminds us of Knuckles’ Chaotix, in the sense that the characters are tethered to something that can build up great momentum to propel great distances. Not the most flattering of comparisons, perhaps, but the fact that there’s little else to compare it to is certainly a positive. Combat features too, complete with a store containing a wealth of power-ups and tools. Some of these power-ups serve multiple purposes, such as a bomb shaped like a miner’s canary that not only kills looters but also lights up dark areas. We’re sensing a strong Spelunky vibe when it comes to using these tools and weapons, and that’s something to get excited about. Wii U and PC owners shouldn’t feel left out – Chariot is also due out on the Nintendo eShop and on Steam before the end of the year.